You've survived the nerve-racking 'I do' moment greeted all your guests, got through the speeches, and now you want to let your hair down and relax at the reception. But what sort of entertainment should you pick to create the perfect atmosphere? Here's a guide to choosing performers to make the evening go with a swing - or jazz, or even hard rock if that's your thing! Music's the big crowd-pleaser at weddings, and comes in a huge variety of formats. Hire a DJ to play records from every possible era, book a string quartet for relaxed classical tunes, a pianist for cocktail-style tunes, or go all out with a live band and big speakers. There's no rule that says your performer has to be of the musical type. Book a magician, stand-up comedian, or professional salsa dancers to put on a show. Mobile casinos with roulette, blackjack and dice games are fast becoming popular with the sophisticated set and will appeal greatly to non-dancers! Get everyone to join in by selecting entertainment that allows them to be part of the fun. A ceilidh band will play traditional dances that are performed in groups, with a caller to tell you when and how to dance the steps. If you think you can get enough people interested, hire a karaoke machine and let the guests be their own live band! The crowd at a wedding can be pretty mixed - everyone from young children to teenagers and elderly relatives - so it's important not to select someone who'll only appeal to the people your own age. Instead of picking a club-style DJ to play dance music, consider one with a broader selection of records or a live band who'll take requests for tunes from all eras. Think about the actual number of people who'll be coming along. A string quartet could be drowned out by a 200-strong crowd, while a live band with PA system will simply overpower a smaller group. Guests will want to be able to talk when the music's playing, so the level shouldn't drown out conversation. Your venue can play a part in the type of act you hire. Some places may not have an entertainment licence, which means bands won't be insured to play there. Noise restrictions in the area may also rule out louder performers. Price will also be a determining factor for all but the largest budgets. As a general rule, the more musicians you hire, the more they'll expect to be paid. Anyone playing live instruments will also cost more than a DJ with recorded music, as you're paying for their skill. Weddings are a tricky environment in which to play live - as mentioned above, bands have got a diverse crowd to entertain and they're unlikely to be watching attentively every minute of the time the act are on stage. Obviously, performers with experience of weddings will prove better than novices, so it's worth finding out how many weddings your act has played at before. If you can, go to see potential performers playing live before you book them. This is a good idea for two reasons; one, because you get to hear exactly what they sound like, and two, you'll get an idea of their 'stagecraft' - how they interact with the crowd, how they dress and how they work together as a band. Any hint of scruffiness or disharmony at this point, and you'll be able to look for another act. Live bands usually play in 'sets' of a certain length, while pianists, harpists and the like may charge by the hour. 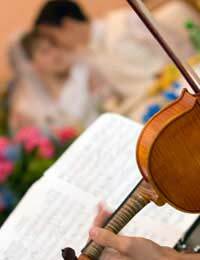 Those experienced in playing at weddings will set a maximum amount of time they're prepared to go on for and take regular breaks. Don't expect much more than two or three hours of live music from one act, and find out exactly how long they'll play for at a stretch. It's also a good idea to check how long they'll expect their breaks to be before getting back on stage. Bands with a lot of equipment will need a venue that allows them to accommodate it. Check your chosen location's got enough space, electrical outlets and so on to meet their needs. They'll also need time to set up. so find out how long they'll need before guests arrive at the venue and arrange for them to have access as early as possible. Above all, your entertainment must be ready to meet your needs - it's your wedding and they should be bending over backwards so you can enjoy yourself. Submit a list of songs to see if they can play them, or ask them to dedicate favourite tunes to people you'd like to thank. And whatever you do, make sure they can play the music you've chosen for your first dance!